Ming C. Lin will lead the University of Maryland’s Department of Computer Science, effective January 1, 2018. 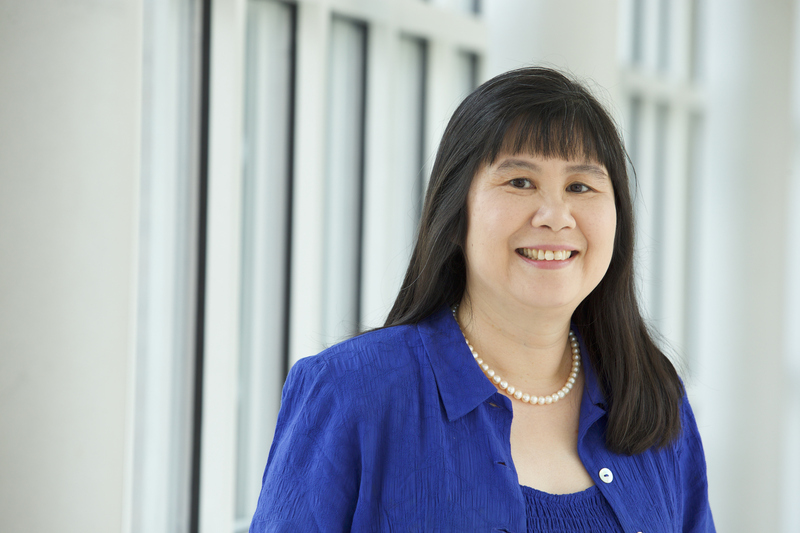 A noted educator and expert in virtual reality, computer graphics and robotics, Lin will assume the role of Elizabeth Stevinson Iribe Chair of Computer Science with a joint appointment in the University of Maryland Institute for Advanced Computer Studies (UMIACS). As chair, she will oversee a department that has experienced significant increases in student enrollment; expanded its research in virtual and augmented reality, robotics, machine learning, cybersecurity and quantum information science; and grown its outreach efforts to fuel more corporate and philanthropic support. The department currently ranks 15th in the nation according to U.S. News & World Report. Lin comes to Maryland from the University of North Carolina at Chapel Hill, where she was the John R. and Louise S. Parker Distinguished Professor of Computer Science and a faculty member for 20 years. She arrives at an opportune time—the department’s faculty, staff and students will move in late 2018 to the Brendan Iribe Center for Computer Science and Innovation, a 215,000-square-foot-facilty that will offer unprecedented opportunities to explore and imagine bold new directions in computer science. The new building became a reality thanks to a $31 million gift from Brendan Iribe, a UMD alumnus and co-founder of the virtual reality company Oculus. Lin spent the past several months meeting with UMD students, faculty, staff, alumni and other stakeholders. She also attended outreach events focused on highlighting opportunities in computer science to prospective students, many of whom are women or other underrepresented groups in the field. The department’s continuing efforts to enhance diversity have resulted in the number of female undergraduates in the department tripling over the last five years, with more than 600 women currently pursuing undergraduate degrees. The department’s undergraduate enrollment has increased rapidly. In fall 2013, the department had 1,386 undergraduate majors; that number swelled to 3,106 in fall 2017, making it one of the largest computer science programs in the country and the most popular major on campus. The department includes more than 50 tenured or tenure-track faculty members and 11 full-time professional track instructional faculty members. They are pursuing new methods of instruction that encourage innovation and entrepreneurship, with these activities expected to significantly ramp up once the Iribe Center opens. “I am encouraged to see that so many faculty members here are active in blended learning and advocate for more makerspaces and other student-initiated activities like the Bitcamp and Technica hackathons where students turn a spark of creativity into new technology,” Lin said. Along with the 16 labs and centers in UMIACS, the department brings in approximately $25 million in external funding each year. The more than 250 computer science graduate students work closely with faculty members, postdocs and others on cutting-edge research that often crosses academic disciplines. They explore topics that include cryptocurrency exchanges, deep learning for autonomous robotics, computational linguistics, genome microbial sequencing and more. Lin plans to bring some of her UNC research group to Maryland, continuing her research in virtual reality, computer graphics and robotics that focuses on multimodal interaction, physically based animations and simulations, as well as algorithmic robotics and their use in physical and virtual environments. Her research has extensive applications in medical simulations, cancer screening, urban computing, as well as supporting city-scale planning, human-centric computing, intelligent transportation and traffic management. Lin earned her B.S., M.S. and Ph.D. in electrical engineering and computer sciences from the University of California, Berkeley. She received a National Science Foundation Faculty Early Career Development (CAREER) Award in 1995, and she is a fellow of the Association for Computing Machinery, IEEE and the Eurographics Association. She also serves on the board of directors of the Computing Research Association’s Committee on the Status of Women in Computing Research. She has authored or co-authored more than 250 refereed publications and has authored or co-edited four books. She is a former editor-in-chief of IEEE Transactions on Visualization and Computer Graphics (2011–2014) and has served on numerous steering committees and advisory boards of international conferences, as well as government and industrial technical advisory committees. Lin also co-founded the 3-D audio startup Impulsonic, which was recently acquired by Valve Software. Lin succeeds Larry Davis, who became interim chair of the department on July 1, 2017. Prior to Davis, Samir Khuller completed a five-year term as chair, serving as the inaugural Elizabeth Stevinson Iribe Chair of Computer Science. Elizabeth Iribe established the endowed chair in 2015 with a $1.5 million donation. Her donation received $1.1 million in matching funds from the state’s Maryland E-Nnovation Initiative Fund, which aims to spur private donations to universities for applied research in scientific and technical fields by matching such donations.